This sounds so incredibly fun! Dinner on a train? I'd call this a top notch pick for anniversary or spouse's birthday. This particular experience runs for about one more month. The festivities occur on the Georgetown Loop and cost $44 per person. The train hosts a variety of other fun events for couples and families including Pumpkin Festival and Holiday Lights trains. You can find a full list of train schedules and pricing HERE. 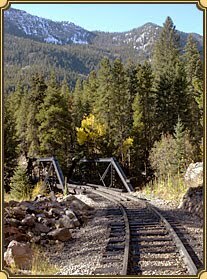 If this picture (from the Georgetown Loop railroad website) doesn't entice you, I don't know what will!